Franklin residents may have not imagined that a finished Constitution pipeline would be much of a problem – unless they are landowners along the route. It would be just a hundred foot wide clear-cut stretching ten miles across Franklin from Route 357 west of the East Sidney Dam to Route 28 up on Franklin Mountain. Those opinions may change now that a second pipeline, the Northeast Energy Direct (NED), has been proposed alongside the Constitution with a compressor station in Franklin. The recent request by Tennessee Gas Pipeline (TGP) for pre-filing of NED with the Federal Energy Regulatory Commission included detailed route maps, which located their station somewhere between Bissell and Chamberlin Hill Roads. An affected landowner reports that a dozen or so sites are under consideration. Constitution has yet to locate their mid-stream compressor station. Solar Turbine model Titan 130 turbine and C65 compressor producing 20,500 hp to move 20,000 cu ft per min at 1,600 psi. The compressor is the cylinder in the center with 30 inch input and output gas pipelines. The turbine is the smaller cylinder upper right, between the air intake and exhaust. — Photo: Solar Turbines, Inc. The TGP booster compressor station would speed the daily flow of the 500 million cubic feet of gas. It would be powered by a gas turbine – similar to a jet engine. The Solar Turbines Titan 130 would provide 20,500 horsepower. 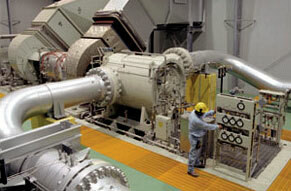 This turbine and the compressor would run day and night, 365 days a year, except for maintenance and repairs. Franklin has no ordinance to limit the noise pollution and protect the station’s neighbors. Even louder than a jet engine is a rocket engine. Whenever work is to be done on the compressor or adjacent pipeline, huge volumes of high pressure gas must be vented to the atmosphere during blow downs, sounding much like a rocket taking off. Additional equipment may include filters and scrubbers on the input line to clean the gas and cooling units on the output line. Waste collected by the filters and scrubbers will need to be disposed of safely. Most stations are remotely controlled, i.e. unmanned. Compressors are a source of air pollution. Neighbors downwind of such stations have unexplained symptoms: respiratory, dermatological, and neurological. Turbines exhaust a continuous stream of combustion products. Blow downs release huge volumes of gas, which is mostly methane but contains numerous minor and trace chemicals. And there are persistent leaks, visible only in the infrared. While methane is not toxic, it is combustible, creating a constant risk of explosions and fires. In February of 2012, TGP had a fire at its station #249 on its #200 pipeline in Carlisle, Schoharie County, which resulted in over $100,000 damage. The Williams’ Dunbar station on the Laser NE pipeline in West Windsor, Broome County, caught on fire in January of this year, the second time in as many years. The certainty of noise and air pollution and the risk of explosion and fire make this industrial installation a very bad neighbor, bringing with it a substantial decrease in nearby property values. And certainly a compressor station is contrary to the goal of keeping the rural character of Franklin, as set-out in our 2006 Comprehensive Plan. The location of this station is not certain. In April, the TGP announcement of NED placed this mid-stream station east of Route 28. In September, its pre-filing request moved the station a few miles to the west. The proposed location could be moved again in its pre-filing (31st October) or filing (September 2015). The middle of the 135-mile pipeline is at mile 67.5, near Crane Hill Road, Sidney. Typically such stations are sited on parcels of a few tens of acres. Although a pipeline company could legally try to use eminent domain to seize a site, in practice it almost always locates a willing seller somewhere along the target zone.